On Thursday, 23 March 2017, the Metropolitan Division Music and Arts Department, in conjunction with the USA Central Territorial Music and Gospel Arts Department hosted an open rehearsal with the Chicago Staff Band (Bandmaster Dr. Harold Burgmayer) led by Grammy Award-winning conductor Bramwell Tovey. This once-in-a-lifetime opportunity for a Salvation Army ensemble to collaborate with such a maestro attracted many visitors from outside the Salvation Army to the Staff Band bandroom. Salvationists, wind band directors, brass band conductors, and conducting professors all gathered at 7:00 pm for enjoy some light refreshments prior to watching the inspiring rehearsal. The evening was organized by the Metropolitan Division’s Director of Music and Gospel Arts, Dr. Jonathan Corry. Corry contacted Tovey having heard that he was in Chicago to perform and conduct a “Gershwin Spectacular” with the Chicago Symphony Orchestra. Tovey was brought up in the Salvation Army and is now principal conductor of the Vancouver Symphony Orchestra. Not only has he led many of the world’s finest orchestras, he is also president of Foden's Band in England and directs the National Youth Brass Band of Great Britain. At the commencement of the rehearsal, Tovey spent time using hymn tunes before launching into detailed work on Deo Gloria (Bramwell Tovey), The Triumph of Peace (Eric Ball), and Just As I Am (Wilfred Heaton). He interspersed the playing with stories of his experiences working with these pieces or meeting the composers. The evening attracted many people from the wider brass and wind community within the Midwest with approximately 75 in attendance. 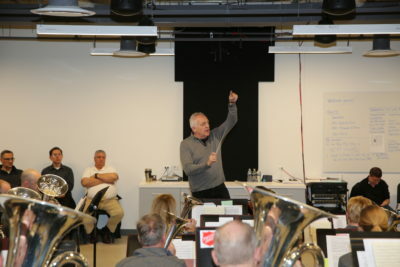 This article was posted in News and tagged Bramwell Tovey, Central Territory Music and Arts Department, Chicago Staff Band, Harold Burgmayer, Jonathan Corry, Metropolitan Division Music and Arts Department, rehearsal, special event on 26 May 2017 .